Army Group A (Heeresgruppe A) was the name of several German Army Groups during World War II. During the Battle of France, the army group named Army Group A was composed of 45½ divisions, including 7 armored panzer divisions. It was responsible for breaking through the heavily-forested Ardennes region. The operation, which was part of Fall Gelb (Case Yellow), was resoundingly successful for the Germans, as the army group outflanked the best troops of France and its allies, eventually leading to France's surrender. In 1942, Army Group South on the Eastern Front against the Soviet Union was split into Army Group A and Army Group B, and Army Group A was responsible for the invasion into the Caucasus. In 1945, months before the fall of Nazi Germany, Army Group A was renamed Army Group Centre. 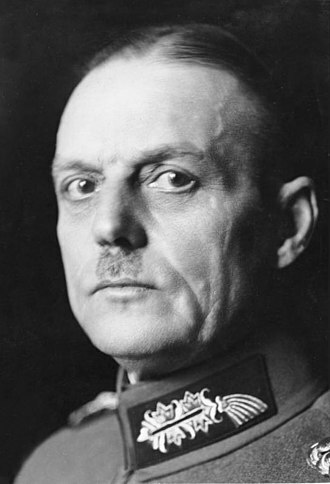 During the German invasion of the Low Countries and France Army Group A was under the command of Generaloberst Gerd von Rundstedt and was responsible for the break-out through the Ardennes. 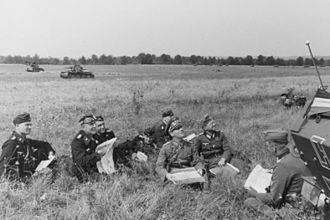 It was composed of 45½ divisions, including the 7 panzer divisions of Panzer Group Kleist. In 1942, Army Group South was in southern Russia on the Eastern Front. For Case Blue (Fall Blau), the summer offensive of the German Armed Forces (Wehrmacht), Army Group South was split into Army Group A and Army Group B. 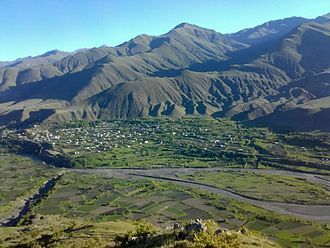 Army Group A was ordered south to capture the oil fields in the Caucasus. On January 16, 1945 Colonel Bogislaw von Bonin, the Chief of the Operational Branch of the Army General Staff (Generalstab des Heeres) gave Heeresgruppe A permission to retreat during the Soviet Vistula-Oder Offensive, rejecting a direct order from Adolf Hitler for them to hold fast. Although Heeresgruppe A escaped encirclement and regrouped, von Bonin was arrested by the Gestapo on January 19, 1945, and imprisoned first at Flossenbürg concentration camp and then Dachau concentration camp. He was eventually liberated along with other prisoners in South Tyrol by the US Army in May 1945. On 25 January 1945 Hitler renamed three army groups. Army Group North became Army Group Courland; Army Group Centre became Army Group North and Army Group A became Army Group Centre. ^ Jackson, J. T. (2003). The Fall of France: The Nazi Invasion of 1940. Oxford: Oxford University Press. ISBN 978-0-19-280300-9. The 32nd Infantry Division of the German Army was mobilized on 1 August 1939 for the upcoming invasion of Poland. 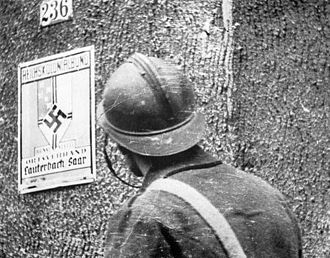 The 32nd Infantry Division was formed on 1 October 1936 in Köslin, in the II Military District under the command of Generalleutnant Nikolaus von Falkenhorst, the division was already mobilize on 1 August 1939 and transferred to the Polish border in the area of Preußisch Friedland. At the outbreak of World War II, the crossed the Polish border on 1 September 1939. On 6 September the division crossed the Drewenz at Gollup and continued its advance to the Modlin Fortress via Sierpc, the division encircled the fortress from the southeast and marched to Warsaw-Praga. In December 1939 the division was moved to the Eifel, here the Feldersatz-Bataillon 32 was transferred to the 162nd Infantry Division in January 1940. In February 1940, the II. /Infanterie-Regiment 94 was handed over to the 292nd Infantry Division, the division marched through Ohain to Cambrai, and from here south of Douai to La Bassée and Lille. Ernst Bernhard Wilhelm Busch was a German field marshal during World War II who commanded the 16th Army. 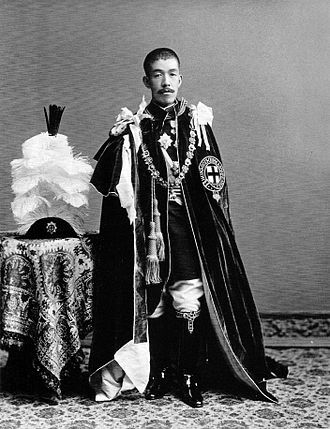 He was a recipient of the Knights Cross of the Iron Cross with Oak Leaves, born in 1885, Busch entered the Prussian Army in 1904 and served during World War I. He was awarded the Pour le Mérite in 1918, after the war, Busch remained in the army reaching divisional level command. 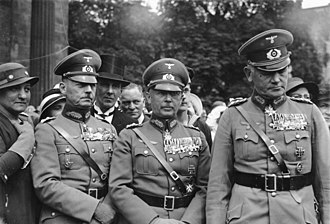 Busch served under Wilhelm List during the Invasion of Poland of 1939, and he was awarded the Knights Cross of the Iron Cross by Hitler. During Operation Barbarossa in September 1941, the 16th Army captured Demyansk before taking part in the siege of Leningrad in positions near from Staraya Russa to Ostashkov, promoted to field marshal, Busch commanded Army Group Centre in 1943 and 1944. Busch was recalled in March 1945 when he became head of Army Group Northwest, along with Kurt Student and his 1st Parachute Army, Busch had the task of trying to halt the advance of Field Marshal Bernard Montgomerys forces into Germany. Most of the Low Countries are coastal regions bounded by the North Sea or the English Channel. The countries without access to the sea have linked themselves politically and economically to those with access to one union of port. The Low Countries were the scene of the northern towns, newly built rather than developed from ancient centres. In that period, they rivaled northern Italy for the most densely populated region of Europe, all of the regions mainly depended on trade and the encouragement of the free flow of goods and craftsmen. 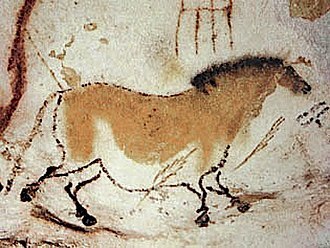 Germanic languages such as Dutch and Luxembourgish were the predominant languages, secondary languages included French, Romance-speaking Belgium, the Romance Flanders, and Namur. Governor Mary of Hungary used both the expressions les pays de par deça and Pays dEmbas, which evolved to Pays-Bas or Low Countries, today the term is typically fitted to modern political boundaries and used in the same way as the term Benelux, which includes Luxembourg. The name of the country the Netherlands has the same meaning. The same name of countries can be found in other European languages, for example German Niederlande, les Pays-Bas, and so on. In the Dutch language itself no plural is used for the name of the modern country, so Nederland is used for the modern nation and de Nederlanden for the 16th century domains of Charles V. In Dutch, and to an extent in English, the Low Countries colloquially means the Netherlands and Belgium, sometimes the Netherlands. For example, a Derby der Lage Landen, is an event between Belgium and the Netherlands. Belgium was renamed only in 1830, after splitting from the Kingdom of the Netherlands, before the Napoleonic wars, it was referred to as the Southern, Spanish or Austrian Netherlands. 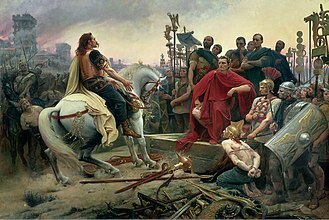 It is still referred to as part of the low countries, the region politically had its origins in Carolingian empire, more precisely, most of it was within the Duchy of Lower Lotharingia. After the disintegration of Lower Lotharingia, the Low Countries were brought under the rule of various lordships until they came to be in the hands of the Valois Dukes of Burgundy. Erwin Rommel, popularly known as the Desert Fox, was a field marshal in the Wehrmacht of Nazi Germany during World War II. Rommel was a decorated officer in World War I and was awarded the Pour le Mérite for his actions on the Italian Front. In World War II, he distinguished himself as the commander of the 7th Panzer Division during the 1940 invasion of France and he commanded the German forces opposing the Allied cross-channel invasion of Normandy in June 1944. 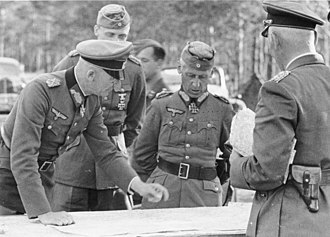 Rommel supported the Nazi seizure of power and Adolf Hitler, although his attitude towards Nazi ideology, in 1944, Rommel was implicated in the 20 July plot to assassinate Hitler. Due to Rommels status as a hero, Hitler desired to eliminate him quietly. Rommel was given a funeral, and it was announced that he had succumbed to his injuries from the strafing of his staff car in Normandy. Rommel was born on 15 November 1891 in Southern Germany at Heidenheim,45 kilometres from Ulm, in the Kingdom of Württemberg, part of the German Empire. He was the third of five children of Erwin Rommel Senior, a teacher and school administrator, as a young man Rommels father had been a lieutenant in the artillery. At age 18 Rommel joined the local 124th Württemberg Infantry Regiment as a Fähnrich, in 1910 and he graduated in November 1911 and was commissioned as a lieutenant in January 1912 and was assigned to the 124th Infantry in Weingarten. He was posted to Ulm in March 1914 to the 46th Field Artillery Regiment, XIII Corps and he returned to the 124th when war was declared. While at Cadet School, Rommel met his wife, 17-year-old Lucia Maria Mollin. They married in November 1916 in Danzig, during World War I, Rommel fought in France as well as in the Romanian and Italian Campaigns. The armies continued to skirmish in open engagements throughout September, as the trench warfare typical of the First World War was still in the future. For his actions in September 1914 and January 1915, Rommel was awarded the Iron Cross, Rommel was promoted to Oberleutnant and transferred to the newly created Royal Wurttemberg Mountain Battalion of the Alpenkorps in September 1915, as a company commander. 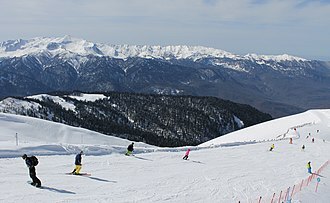 The Ardennes is a region of extensive forests, rough terrain, rolling hills and ridges formed by the geological features of the Ardennes mountain range and the Moselle and Meuse River basins. Geologically, the range is a extension of the Eifel. The eastern part of the Ardennes forms the northernmost third of the Grand Duchy of Luxembourg, called Oesling, the greater region maintained an industrial eminence into the 20th century after coal replaced charcoal in metallurgy. The region is typified by steep-sided valleys carved by swift-flowing rivers and its most populous cities are Verviers in Belgium and Charleville-Mézières in France, both exceeding 50,000 inhabitants. The Ardennes is otherwise relatively sparsely populated, with few of the cities exceeding 10,000 inhabitants with a few exceptions like Eupen or Bastogne. The Eifel range in Germany adjoins the Ardennes and is part of the geological formation. N. B. the Belgian Province of Luxembourg in the above list is not to be confused with the known as the Grand Duchy of Luxembourg. The Ardennes is an old mountain formed during the Hercynian orogeny, in France similar formations are the Armorican Massif, the Massif Central, the low interior of such old mountains often contain coal, plus iron and other metals in the sub-soil. This geologic fact explains the greatest part of the geography of Wallonia, the region was uplifted by a mantle plume during the last few hundred thousand years, as measured from the present elevation of old river terraces. This geological region is important in the history of Wallonia because this old mountain is at the origin of the economy, the history, Wallonia presents a wide range of rocks of various ages. Some geological stages internationally recognized were defined from rock sites located in Wallonia, except for the Tournaisian, all these rocks are within the Ardennes geological area. Before the 19th century industrialization, the first furnaces in the four Walloon provinces and in the French Ardennes used charcoal for fuel and this industry was in the extreme south of the present-day Belgian province of Luxembourg, in the region called Gaume. The 12th Infantry Division – known as the 12th Volksgrenadier Division – was a Wehrmacht military unit of Nazi Germany that fought during World War II. The division was formed in 1934 and it participated in the invasion of Poland in 1939 and the 1940 campaign in France and the Low Countries. In the Soviet Union, the division joined Operation Barbarossa, the division was destroyed in the Soviet Operation Bagration in the summer of 1944. The division was re-activated in September 1944 and posted to the newly created Western Front, the division was formed in 1934 from Pomeranias Mecklenburger population, with its home station being in Schwerin. 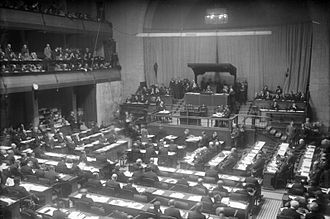 In order to hide Germanys remilitarisation – a breaking of the terms of the Treaty of Versailles – the unit was codenamed Infanterieführer II to disguise its size. It did not assume its bona-fide designation until the creation of the Wehrmacht was announced in October 1935, alongside the name change, Lieutenant General Wilhelm Ulex was placed in charge of the division, before being replaced by Major General Albrecht Schubert the following October. Schubert was promoted to Lieutenant General in March 1938, in November, the command over the 89th Infantry Regiments 1st Battalion was given to Helmuth Beukemann. 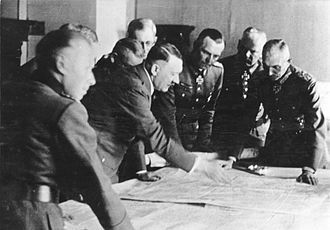 In July 1939, the division was moved to Koenigsburg, East Prussia as Germany prepared for the invasion of Poland. 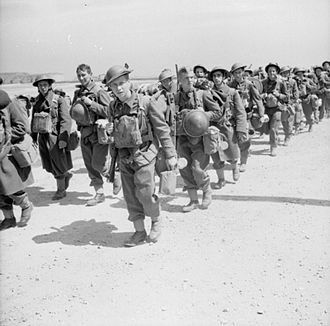 The 12th Infantry took part in the invasion of Poland, following the campaign, the division remained stationed in the region until May 1941 in an occupational capacity, when it was ordered to return to East Prussia. In June 1941 the division joined Operation Barbarossa under Army Group North as an element of the 16th Army and it took part in Army Group Norths capture of the Latvian city of Daugavpils, sweeping north-eastward to Leningrad where it was finally stopped in its tracks during the siege effort. With support from Hermann Göring, planes containing supplies were flown in to aid the divisions while they were in the pocket for some 81 days between 8 February and 20 March. 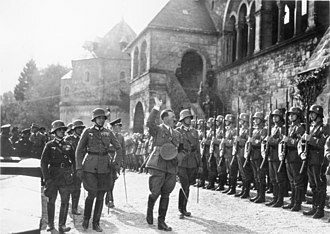 Göring would gloat about his success in freeing the pocket during the Battle of Stalingrad that year, while liberated, the 12th Infantry had left the pocket in a much-weakened state. The 7th Panzer Division was an armored formation of the German Army in World War II. It participated in the Battle of France, the invasion of the Soviet Union, the occupation of Vichy France, the division fought successfully in France in 1940, and again in the Soviet Union in 1941. In May 1942, the division was withdrawn from the Soviet Union and sent back to France to replace losses and refit. 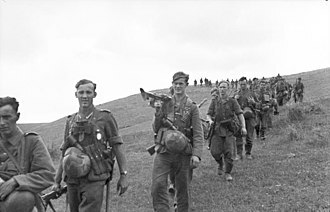 The division fought in the offensive at Kursk in the summer of 1943, suffering heavy losses in men. 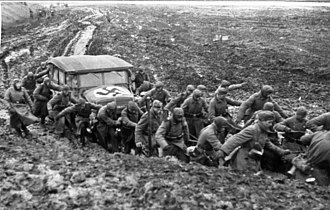 Through 1944 and 1945, the division was understrength and continuously engaged in a series of defensive battles across the eastern front. It was twice evacuated by sea, leaving what was left of its equipment behind each time. After fighting defensively across Prussia and northern Germany, the men escaped into the forest. In October 1939, the 2nd Light Division became the 7th Panzer Division and it consisted of 218 tanks in three battalions, with two rifle regiments, a motorcycle battalion, an engineer battalion, and an anti-tank battalion. 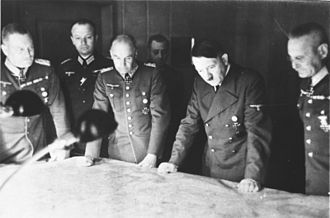 Newly promoted General Erwin Rommel, who had served on Hitlers staff during the Invasion of Poland, was able, with an intervention from Hitler, upon taking command on 10 February 1940, Rommel quickly set his unit to practicing the maneuvers they would need in the upcoming campaign. The invasion began on 10 May 1940, Rommel was active in the forward areas, directing the efforts to make a crossing, which were initially unsuccessful due to suppressive fire by the French on the other side of the river. 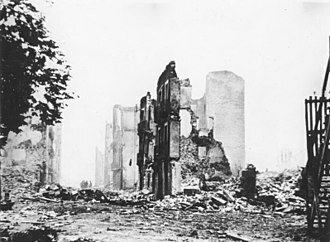 By 16 May the division had reached his objective at Avesnes. On 20 May the division reached Arras, General Hermann Hoth received orders that the town should be bypassed and its British garrison thus isolated. He ordered the 5th Panzer Division to move to the west and 7th Panzer Division to the east, the following day the British launched a counterattack, deploying two infantry battalions supported by heavily armoured Matilda Mk I and Matilda II tanks in the Battle of Arras. The German 37 mm anti-tank gun proved ineffective against the heavily armoured Matildas, the 25th Panzer Regiment and a battery of 88 mm anti-aircraft guns were called in to support, and the British withdrew. Richard Ruoff was a general in the Wehrmacht of Nazi Germany during World War II. 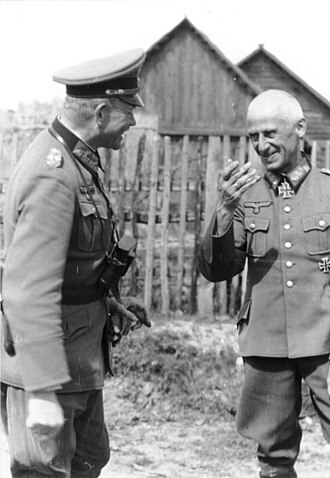 He commanded the 4th Panzer Army and the 17th Army on the Eastern Front, Ruoff took command of V Army Corps on 1 May 1939, and led this unit into World War II. He concurrently commanded V Wehrkreis in Stuttgart, Ruoff was given command of the 4th Panzer Army from 8 January 1942 to 31 May 1942. The 4th Panzer Army was part of Army Group A which was formed when Army Group South was split into two formations for the offensive of 1942. Ruoff commanded the 17th Army from 1 June 1942 to 24 June 1943, the 17th Army was part of Army Group A. Ruoff was the commander of the 17th Army when, on 3 June 1942, the Italian Expeditionary Corps in Russia was briefly subordinated to it. From June to July, the German 17th Army, the CSIR, by July 1942, Ruoff lost the Italian unit. The CSIR was subsumed by the larger Italian Army in Russia, during the late summer, as part of Army Group A, Ruoff and the 17th Army attacked towards the Caucasus oilfields. Walther Kurt von Seydlitz-Kurzbach was a general in the Wehrmacht of Nazi Germany during World War II. He was a recipient of the Knights Cross of the Iron Cross with Oak Leaves, Seydlitz-Kurzbach was relieved of his command in early 1943 and abandoned the German army lines under German fire to surrender to the Red Army. He became a Soviet collaborator while a prisoner of war, after the war he was convicted by the Soviet Union of war crimes. In 1996, he was pardoned by Russia. Seydlitz-Kurzbach was born in Hamburg, into the noble Prussian Seydlitz family, during World War I he served on both fronts as an officer. During the Weimar Republic, he remained an officer in the Reichswehr. The corps was subordinated to the Sixth Army during the Battle of Stalingrad, on 25 January 1943, he told his subordinate officers that they were free to decide for themselves on whether to surrender. Paulus immediately relieved him of command of his three divisions, a few days later, Seydlitz fled the German lines under fire from his own side with a group of other officers. He was taken into Soviet custody, where he was interrogated by Captain Nikolay Dyatlenko and he was identified by the interrogations as a potential collaborator. 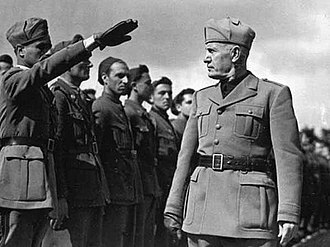 In August 1943, he was taken two other Generals to a political re-education center at Lunovo. A month later, he was sent back to prisoner of war camps to recruit other German officers. He was a leader in the forming under Soviet supervision of an anti-Nazi organization and he was condemned by many of his fellow generals for his collaboration with the Soviet Union. He was sentenced to death in absentia by Hitlers government and his role in Soviet propaganda was largely equivalent to that of Andrey Vlasov in Nazi propaganda. In 1949 he was charged with war crimes and he was put on trial for responsibility for actions against Soviet POWs and the civilian population while in Wehrmacht service. In 1950, a Soviet tribunal sentenced him to 25 years’ imprisonment, but in 1955 he was released to West Germany, Seydlitz died on 28 April 1976 in Bremen. Kluge reviews Légion des Volontaires Français, a French collaborationist formation, November 1941. Hitler in Poland (September 1939). 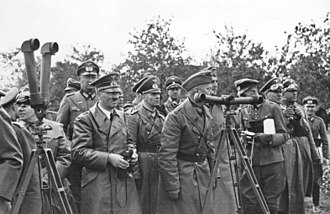 Rommel is on his left and Martin Bormann on his right. Wilhelm List (left) and Walter Kuntze (right) take a walk in the prison yard during the Hostage Case. 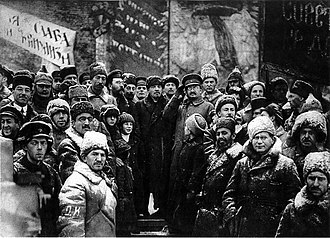 Richard Ruoff (left) in the Soviet Union. Offensive of the Red Army south of Lake Ilmen 7 January–21 February 1942.